Children and dogs. A match made in heaven or a complete nightmare? A lot obviously depends on the age of the children and the temperament of the dog. What will make the biggest difference is setting clear ground rules – for both the dog and the kids! An adult should always supervise children and dogs, as both parties can be guilty of unsuitable behaviour if not closely watched! Children can often be as unpredictable as dogs. No hugging/cuddling the puppy! I know you want to, but they do not like it! Children need to be actively taught that their dog has feelings and is not just a cuddly interactive toy. Don’t pick the puppy up! It’s not a doll! Most puppies feel very insecure when picked up if they are not held securely. This is an adult-only exercise. Do not disturb the puppy when it’s sleeping. It is important that children realise dogs need time to rest. All dogs should have a quiet place that they can retreat to when they’ve had enough excitement! Try and avoid situations that may get the puppy over excited. Encourage the kids to do calm things with puppy. Dogs, especially puppies, need to be taught that children are not fair game for puppy play biting and boisterous play. Adults may need to intervene if things get too hot before accidents happen. Children can be taught the importance of staying calm and still if their dog or puppy becomes over excited. The easiest way to explain this to young children is to show them how to stand still with their arms folded. Tell them to ‘Be a Tree’ and teach them to call an adult to distract the puppy away. No rough and tumble games or chasing games. This will encourage your puppy to bite and to see your kids as a giant tug toy. Chasing games teach bad habits. Puppies soon grow and even the smallest can knock a child over, or learn how much fun it is to bite at clothing and ankles. Chasing your dog may seem like great fun but can also escalate into long-term problems with recall and possession of articles. Kids can play appropriate games such as frisbee, football, fetch, hide and seek and tuggy games with a ragger toy. These are safe games and your dog will love you forever! Better still, take your dog to a training class that encourages children to come along. As a rough guide children from about seven years and above can take an active role in training. Children often make excellent trainers especially with clicker training. 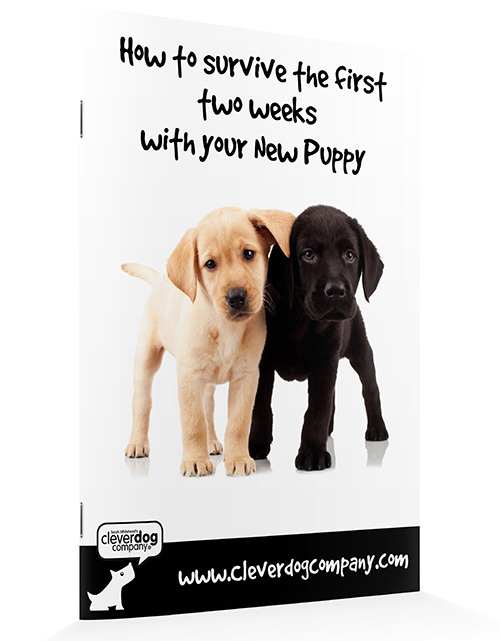 Clicker training is based on positive reinforcement using a clicker to mark the behaviour that is being rewarded. Most children have excellent timing; after all they get lots of practise using computer games! Alpha Classes actively encourage kids to come to class and train their dogs! See Alpha Shop for “Puppy Training for Kids” by Sarah Whitehead.